sailboat. : To Do in August. There are approximately one million (may be a slight exaggeration) files on my computer that I haven't named properly. They all have names like 'fjkdsfhi' and as such I have no idea what they are, which is just brilliant. Thanks a lot past Jennie. Needless to say I need to sort that out. This may sound overly pretentious and perhaps a little bit silly, but I think I need to write a kind of 'mission statement' for life (personal goals, career goals, etc) so that I can start taking meaningful steps to actually getting somewhere. Not necessarily a '5 year plan' or anything like that because I'm not sure that would be particularly helpful, but at the moment I suppose I just feel a little bit stuck. My only real starting point is I don't want to work in retail (unless it's my own brand or for a brand I feel really bloody passionate about), so I need to work from that point. We'll see where these next few weeks take me. Maybe stop eating sandwiches at midnight when I should be asleep, even if there are vegetables amongst the cheese. Wait, is it true that cheese gives you vivid dreams if you eat it at night? Because if that is a thing, it's been happening to me. Make a really detailed to-do list for the day every morning, including even the silly little things that need to be done like drinking 8 glasses of water. This is partly to scare myself into getting started as soon as possible but also so I get to check off lots little tasks, which will hopefully keep motivated. Let's do this, August. I'm ready! 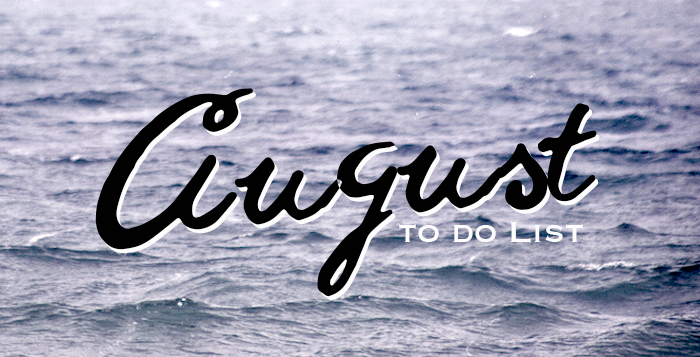 Do you have any goals for August? I don't think that kind of plan is pretentious, I think it is a really useful exercise in terms of focusing on which direction you want to take. And yes cheese = vivid dreams for me too! Making a to do list in the mornings is such a great idea! I've been writing detailed to do lists every morning and it's helping me remember to do the little things - I need to add drinking 8 glasses of water! I love ticking things off to-do lists! I used to be the absolute worst for saving things with the names they had when I downloaded them but I have got pretty good now at naming things properly and I cannot TELL you how many hours of my life it must save - good luck!! I think it's great to have a life plan even for the next couple of months. Sometimes we get lost between errands and social life and chores and kinda forget what we want to do. Happened to me. Start small and baby steps? I love your to-do list! Plan life = hard. Stop eating sandwiches late at night... Should be achievable, right? i love this list and for some reason it's getting me really positive and pumped up for august! i love that it's still summery yet we're right there heading into fall. both are my favorite seasons in very different ways. good luck figuring out your "mission statement" - it definitely takes some soul searching, researching, reflecting, and lots of trial and error at times! I need to properly name all the files on my computer too. It's such a mammoth task I've just been putting i off whilst it's been getting even bigger! Omg, I'm the same with the midnight snacks.. Agh so frustrating. This to do list right here isn't ridiculous at all, it's useful! And it's important to remind yourself to drink lots of water, etc. Have a lovely August! I feel like I need to get more efficient when it comes to taking out tasks. I've just started a bullet journal to help but so far it's like 'upload post', 'comment on 10 blog posts', 'work' etc. I bet it'll be so much more effective once I'm at uni though. I really need to focus on #2 as well! My boyfriend keeps going on about "cheese dreams" and I've always kind of waved it off as nonsense but maybe he is speaking the truth after all, haha! eating sandwiches in the middle of the night is the ebst! sadly not the healthiest haha :( and I really need to drink more water,too! I love your mystery file names!! Haha I've moved to London this week ahead of starting a new job, so this month is a pretty big one! My main goal is to start to up my exercise, as I'm eating well but not moving my body much! I've been trying to make more to-do lists as well! I definitely helps with productivity and I end up feeling so much better for it! Haha, I'm the same, past me is the worst. I would love to know why I feel the need to have collected a huge folder of funny tumblr posts on my laptop. Sounds like you're gonna get on top of things this August! It’s so nice to find new blogs to read - you’ve obviously come highly recommended so I look forward to keeping up with your posts! I need more lists in my life, you've got a good few ideas! i am ALL about the daily to do lists. i put the most basic stuff on there like "tidy room" and "wash hair" because if you've got 6 things on there and you can cross off 3 really easily it makes you more motivated to cross off the rest. i've been tricking myself with that one since high school, haha. I can't help with the rest, but I've found Trello really helpful for to-do lists and managing projects, like DIY things around the house. I really like that you can tag other users to do things...so I can tag Dave to build bookcases in the dining room for example :) Very handy!